Casa Cabernet is the perfect retreat in which to relax and soak in the NAPA VALLEY LIFESTYLE. "It is the ultimate destination for those seeking chic tranquility." It is an ideal, restorative place for long-term residents who are re-locating to St. Helena--working with realtors to find a new home, or re-modeling an existing home. Or, simply a great get-away for a wonderful vacation. It is located on five acres in the premier Rutherford Appellation or Rutherford Bench, as it is known, just 2 miles from the town center of St. Helena. The Rutherford Bench refers to the 6 mile stretch that boasts the most famous soil profile. It is known to produce celebrated wines that taste dark berries and sassafrass with dusty tannins. The primary residents here are grapevines, and especially Cabernet Sauvignon Vines. Your stay at Casa Cabernet, in the heart of Napa Valley Wine Country, is owned and lovingly operated by Gaye G. Cook, a longtime resident of the Valley. This is the kind of place that feels like home from the moment you enter, with first class amenities, to ensure that your stay is luxurious. Once a week maid service is provided by the owner. Other amenities include once a week linen service, wood for the fireplace, bottled water, and more. Rooms are spacious, all with lovely views, a private terrace and grape arbor under which you may enjoy a picnic or evening under the stars. Guests can shop the local Farmers Markets and cook in the well-equipped kitchen or imbibe in one of the many fabulous restaurants throughout the Valley, many of which are nearby. You can take the cottage bikes for a spin or walk through the lush vineyards. One of the many walks takes you directly to the gourmet market, Dean and Deluca, where you can indulge in anything your heart's desire. Many of the fine wineries are within walking distance of the cottage. On a warm summer's day you can lounge around the beautiful swimming pool and soak in the gorgeous views of Mount St. John. Your cottage is set amongst the vines with forty two acres of privacy. You can be in the town of St. Helena in minutes or travel to nearby destinations, such as San Francisco, Sonoma, Healdsburg, and even the north coast beaches such as Bodega Bay. The cottage is a fabulous place to recharge your batteries after a day of exploring. I think you will enjoy reading the reviews to get a real sense of living in a truly special place. IT IS A NO SMOKING, NO PETS, ADULTS ONLY ENVIRONMENT. I am a long time resident of the Napa Valley, having moved here in 1973, when we began the process of developing five acres, some in grapes and the remainder in home, garden structures, swimming pool and guest house. Prior to that, I graduated from The University of Ca. Berkeley where I affiliated with the Kappa kappa Gamma Sorority. After graduation, I taught first grade in Berkeley for six years. My husband and I raised two sons who have families of their own, and I am a proud Mother and Grandmother. I now rent my guest house and enjoy the process. It is fun to meet new people and to provide for them so that they have a memorable time in The Napa Valley. 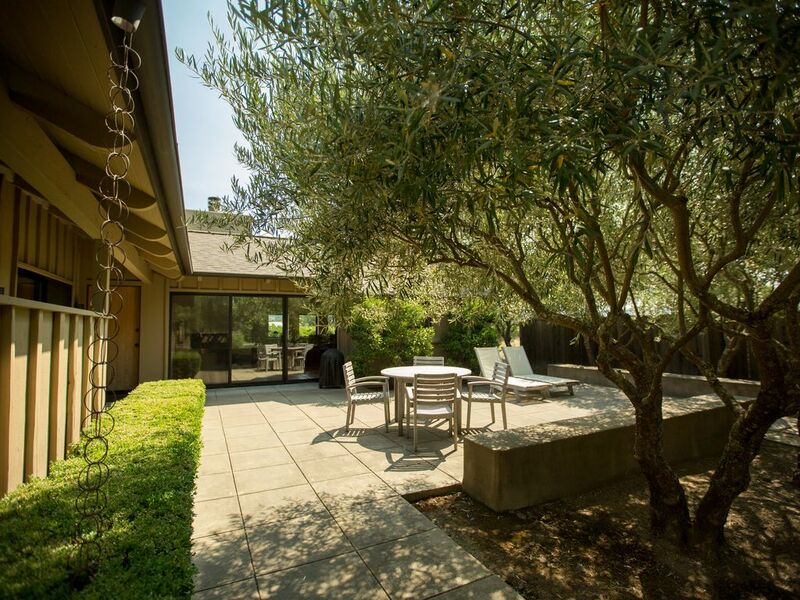 This property is considered to be one of the most desirable in the Napa Valley. It is a five acre property with 42 acres surrounding it. There are magnificent views of the vineyards and Mount St. John. It is within walking distance of Dean and DeLuca, a nice walk for coffee and treats, or one of their outstanding sandwiches. If you choose not to cook, you can get a gourmet dinner to take home. It is a short distance to the town of St. Helena and Rutherford, Ca. This property, Casa Cabernet, is a small home for one or two people. When available a larger 3 bedroom, 2 bath home can be rented. Casa Cabernet Grande is truly stunning. It is only available when the smaller Casa is not rented. The bathroom is convenient to the bedroom. It has all the necessary conveniences, a tiled vanity with ample storage underneath, good lighting, and gorgeous views, but still so private. The shower/bath tub are tiled with a high quality shower head. It is impeccably clean. An ample supply of towels are available, and cleaned weekly. Terry bathrobes are supplied. The cottage is located close to town, but far enough away to enjoy the peace of the countryside. The town of St. Helena is a myriad of interesting shops, art galleries, and wine tasting bars, excellent restaurants, a fine library, movie theatre, two grocery stores, and much more. The views of the Eastern and Western mountains of the Napa Valley from the cottage are beautiful. Yes, the house has air conditioning. There is a wood fireplace located in the great room. an ample supple of 'Hotel Collection' towels are in the furnishings. There is a full gym and spa located nearby. There is also a spa in the same location. Basic service is included. If you wish to up-grade, you pay the difference. A Sonos Sound System is provided. Guests can utilize this system from their apps on their Iphone. The gardens surround Casa Cabernet as well as Casa Grande. There is a very large lawn surrounding the swimming pool. The gardens are available to the guests. There are two bicycles on the property to use. They are equipped with baskets for shopping at Dean and DeLuca. Helmets are provided as well as a lock. There are public courts in the Crane Park. Meadowwood Country Club also has tennis courts. Golf is available at Meadowwood Country Club in St. Helena and Chardonnay Golf Course south of Napa, Ca. There is a golf course in Yountville at the base of the Veteran's Home. There is a sauna at the Napa Valley Health Spa as well as spa treatments and a heated swimming pool. a large 20 X42 foot in ground pool. It is available for use at any time. There is a spa and gym nearby, which you are able to join on a part time basis. It is wonderful, and many of my guests have joined this Napa Valley Health Spa. ** Full Kitchen: complete kitchen with quality appliances ** Cooking Utensils Provided: the kitchen is equipped to cook for two ** Sub Zero refrigerator drawers with an ice maker. **Under-counter refrigerator ** Private Pool: swimming pool is 20x42 ** swim towels included ** Wood Fireplace: firewood provided ** Charcoal BBQ Grill: charcoal is provided * * Deck/Patio: patio with table and four chairs,two chaises, arbor with two tables and four benches ** Mountain View: the cottage is on the valley floor with views of the Eastern & western slopes and mountains ** All of the rooms have skylights and are furnished with ceiling fans,and high beamed ceilings. Spectacular views from all rooms. There is a new Sony flat screen tv. Weekly maid service is included. Another Great Stay at Casa Cabernet! We stayed at Casa Cabernet four years ago, after which I wrote an extensive review of our fabulous experience at this property. While the fact that we returned is testament to how wonderful the first trip was, I'll summarize. You will not want to leave this place. The house itself is a great retreat. With its open floorplan and windows/sliders to the outside patio, it gives the impression of an even larger space. Very cozy and well-equipped. The property is park-like, beautifully landscaped and sits in the midst of vineyards with amazing 360 degree views. The location is perfect, minutes away from downtown St. Helena with easy access to Calistoga, Yountville and Napa. We also made the trip to Sonoma Valley many days with a relatively short, but winding, drive on the Oakville Grade. As others often point out, I would be remiss in not mentioning the owner, Gaye, who enhances the experience even further by ensuring that you enjoy your time at Casa Cabernet. She takes tremendous pride in the property and rightfully so. That pride is reflected in the condition of the rental and the overall grounds. The weekly cleaning and landscaping service is excellent and unobtrusive. This is a truly special and unique place which you will fall in love with, and will not find replicated elsewhere in the Valley. A picture perfect California-style and decorated cottage totally surrounded by vineyards and during the Spring, totally immersed in the glorious yellow glow of the mustard blooms, an artist's delight. The architectural design is so carefully crafted that each window uniquely presents an artist's view of this beautiful property. Peace and serenity, magnificent 360 degree mountain views, charming walks thru neighboring vineyards, close proximity to lovely downtown St. Helena are just a glimpse of life at Casa Cabernet. Outstanding restaurants, upscale shopping, the Culinary Institute of America at Greystone, picturesque wineries, close proximity to many hiking trails are but a sample of what awaits you at Casa Cabernet. The property reflects the meticulous taste of the owner who respects your privacy and yet so approachable should you have a question or would like a recommendation or two to be sure you experience the Best of Napa Valley, which actually is right where you are, at Casa Cabernet. Thank-you "Little Silver" for your kind and generous review depicting the "life style" at Casa Cabernet. I ordered some pretty spectacular weather in your honor, didn't I? It is always such a pleasure to have you, and I hope you will return. When my guests are happy, I am happy. Casa Cabernet was truly a God Wink. I had prayed for a place to take a month long sabbatical from everything in my life. I wanted a place to be still and reflect. I found that in Casa Cabernet - quiet, beauty and a place full of peace. I took cooking classes, toured winery's, ate at many of the local restaurants, meet wonderful people, visited the local farmer's market once a week, read, wrote, laid out by the pool and sipped wine in the lovely courtyard. I got to watch the harvest of the grapes towards the end of my trip. The aroma of the grapes in the air was unreal. Oh, Did I mention the stars! The property was beautiful, immaculate, well appointed. The views were breathe taking from the property's gardens and vineyards to the surrounding vineyards and mountains views. I had to pinch myself at times. I can't say enough about it. I truly fell in love with Casa Cabernet and the owner Gaye. She was lovely, warm, kind, helpful, fun and inspiring. I made a wonderful friend. I feel blessed to have meet her. Casa Cabernet has everything you would need for a lovely vacation. I felt at home from the moment that I got there. I did not want to leave! I will be going back as soon as I can. It holds a very special place in my heart. Susan--it was such a joy to know you and a real pleasure to have you stay at Casa Cabernet. I marveled at your ability to move around and enjoy all facets of the great Napa Valley. Yet, you easily kicked back and were able to enjoy the relaxing environment that the Casa offers. Once again, on our second stay, the Casa met all of our expectations. The cottage is warm and comfortable, immaculately clean, offering all the comforts of home. Sit by the roaring fire on cool nights listening to your favorite music on the Sonos sound system. The grounds are carefully maintained, dotted with olive trees Surrounded by vineyards, yet minutes to several of the finest wineries and restaurants in the area. Discovered several new walking trails in St. Helena, and at neighboring Lake Hennessey, in addition to just walking in the vineyards in the neighborhoods surrounding the Casa. All of the Valley is within easy access - from Calistoga to Napa,. Within an hours drive is the ferry (a 60 minute ride) to the San Francisco Ferry Building for just a day trip or overnight if that is a desire. One can relax at the Casa by the pool with its unparralled views of the surrounding landscape, or if both a gym and outdoor lap pool is a preference, as it was for us, minutes away at the local Health Spa and Fitness Center. Gaye is caring and attentive to the needs of her guests. The Casa is a reflection of her love and pride in this very special treasure. What a pleasure it was to have you return to Casa Cabernet, and I look forward to seeing you again in March of 2018. The cottage & property were absolutely perfect! Casa Cabernet is all that the description says it is. Gaye is a wonderful host and her entire property is immaculate. She is lovely and very attentive to your needs while maintaining your privacy. The cottage was definitely my home away from home for the month and I hated to leave. My only concern is that I told so many people about my find that I fear she will be booked when I want to return. A wonderful, charming and ideal setting to explore the Napa Valley. All the amenities you need to create a 'home from home' whilst you are away. The owner is charming and delightful allowing use of her own Pool should you wish. If you are looking in this area, look no further. Casa Cabernet is in close proximity to many of the areas finest restaurants and wineries, as well as downtown St. Helena. It is an easy drive to Sonoma County, Marin, and San Francisco. Other Activities: shopping, wildlife viewing, health/beauty spa, hot air ballooning ,wineries, visiting the Culinary Institute of America, walking to wineries nearby and buying gourmet foods at Dean and DeLuca. The French Laundry, Press, and many other fine other dining experiences are within an easy drive. Sonoma, Napa, Healdsburg, and Napa, and Bodega Bay and other beach areas are other places to visit that are nearby. 2018-2019 RATES: Monthly $5.000 Before securing the reservation, my guests must agree to receive and sign a rental agreement. The rental agreement will specify when monies are due. The first payment of $2,500 be due shortly after booking with the owner. The remainder will be due 60 days before taking occupancy. The security deposit of $1,500 is due 15 days prior to residency. Credit Card Charges will be the responsibility of the tenant. Weekly Cleaning is included in the price. It is always beneficial for both future tenant and homeowner to discuss the property and payment methods before booking. PLEASE CONTACT Gaye G. Cook at 707 963-5589 RATES FOR 2017 $5,000 CREDIT CARD FEES WILL BE PAID BY THE APPLICANT E-CHECK PAYMENTS THROUGH HOMEAWAYS PAYMENT PARTNER --FEES WILL BE PAID BY APPLICANT. THERE IS A 3% CHARGE MADE FOR ALL E CHECK PAYMENTS. PLEASE DISCUSS A CANCELLATION POLICY WITH THE HOMEOWNER.